“My personal history is one directed by a loving Heavenly Father, a loving family, and a loving religious community – and how happy I am to express aloud some of my cherished recollections." 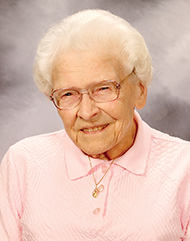 When Sister Therese Mary Foote wrote her first St. Catherine letter on August 5, 1980, she began her personal story with the above words. Dorothy Marilyn Foote was born April 23, 1926, in Cleveland, Ohio, to Francis (“Frank”) and Florence Walsh Foote. She was the youngest of three children, after Bob, the oldest, and Jean. Frank came from a Protestant family, but as his relationship with Florence grew, “he chose to take instructions in order to learn more about a faith that could influence so beautiful a person as Mom,” Sister Therese Mary wrote. Sister Therese Mary called her father intelligent, sensitive, and ambitious, an excellent judge of character, and someone with a sense of humor and the ability to persevere. He was a traveling salesman until a comment from little Dorothy changed everything. When he was on the road, Dorothy got to sleep in her mother’s bed, but when he came home she had to forfeit her coveted spot – and was none too happy about it. At one point, she asked her mother, “Is that man coming home again?” and when Frank heard that his own child referred to him as “that man,” he knew it was time to stay home for good. Memorial gifts may be made to Adrian Dominican Sisters, 1257 East Siena Heights Drive, Adrian, Michigan, 49221. Leave your comments and remembrances (if you don't see the comment box below, click on the "Read More" link). 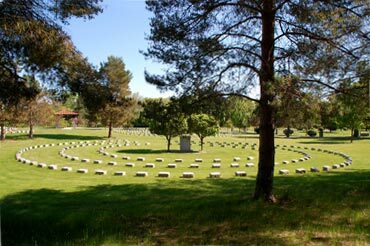 Our Adrian Dominican cemetery with its circular headstones is a beautiful place of rest for women who gave their lives in service to God—and a peaceful place for contemplation and remembrance. We will post memorial reflections on our faithfully departed Sisters and Associates. If you would like to reflect on a Sister or Associate who has gone before us, please send your reflections – no more than 500 to 600 words – to . We invite you to meet some of the wonderful women who have recently crossed into eternity.